In a vote of 4-1 last week, the Board of Standards and Appeals (BSA) voted to deny our appeal of 180 East 88th Street. In their comments, Commissioners acknowledged the deficiency of the Zoning Resolution’s text regarding this issue, but eventually conceded that the Department of Buildings (DOB) acted within its right to approve the subdivision of the zoning lot that created the micro-lot. Because the text does not prescribe a minimum lot size in this zoning district, the Commissioners therefore determined that DOB was reasonable in approving the 10 foot lot. holistic set of solutions to address not only inter-building voids, but also tighten the definition of a zoning lot, and introduce restrictions on floor to ceiling heights. Mayor de Blasio and DCP have previously committed to addressing the mechanical void exemption by the end of the year, but have not made any further public statement since June. Despite the ultimate ruling, several Commissioners suggested that a legislative solution is needed to disallow use of this loophole in future projects. Specifically, DCP should specify a minimum lot size for commercial districts within the text of the Zoning Resolution. Commissioner Salvatore Scibetta cast the sole vote in support of our appeal, stating in his verbal comments that the subdivision was a violation of the spirit of the Zoning Resolution. Further information on the BSA’s reasoning will be available when the written decision is released in the next several weeks. Clear legislative action on the part of the DCP is required to strengthen our city’s zoning rules so they provide the clarity, consistency, and predictability necessary to discern their intent, and to address the many types of loopholes exploited in service of unreasonable and out of scale buildings on the Upper East Side and in residential neighborhoods citywide. FRIENDS, along with Carnegie Hill Neighbors and the support of our local elected officials, has been challenging the carved out 10 foot by 22 foot portion of 180 East 88th Street’s original zoning lot since October 2017. The decision follows two public hearings in July and October 2018. For additional background information on the project and the challenge, click HERE. The Department of Buildings (DOB) has filed an Intent to Revoke its prior approval for a 39-story, 775 foot tall tower at 50 West 66th Street. Extell, the developer, first filed for a 25-story, 260 foot mixed-use structure back in 2015. However, post-approval amendments gave way to the Snohetta-designed tower with a 160 foot “mechanical” void at the base whose construction began in late 2017. Now, the DOB’s Manhattan borough commissioner has indicated that the inclusion of this excess empty space is “not customarily found in connection with residential uses.” The developer has 15 days to respond. This reversal comes as a welcome surprise as the DOB had previously rejected a zoning challenge filed by Landmark West!, local Upper West Side residents, and Council Member Helen Rosenthal in November 2018. Manhattan Borough President Gale Brewerapplauded the DOB’s decision to revoke the previously-approved building form. In a statement last night she said, “By ruling that a mechanical space with a floor-to-floor height of 160 feet is not an ‘accessory use’ allowed under zoning, DOB correctly interpreted both the letter and the intent of the City’s zoning code. This is a victory not only for the Upper West Side, but for communities all over the city that find themselves outgunned by developers who try to bend or break zoning rules for massive private profit.” The Borough President, our local Council Members Ben Kallosand Keith Powers, and the Manhattan delegation of the City Council have long supported the efforts of FRIENDS of the Upper East Side and other advocacy groups in the fight against zoning loopholes. 50 West 66th Street is just one of many recent plans to create residential “buildings on stilts” that utilize void spaces excessive floor-to-ceiling heights, and other loopholes that serve as workarounds to the City’s Zoning Resolution. So far, it is unclear whether the West 66th Street decision will have a direct effect on the proposed building at 249 East 62nd Street, on the East Side, just steps away from the Treadwell Farm Historic District. In May 2018 the DOB approved the use of a similar mechanical void of 150 feet, but the West Side reversal signals a new perspective from the agency. At a town hall meeting last year, Mayor Bill de Blasio committed to addressing the issue of exempt mechanical voids, but thus far, there have been no proposed amendments to the zoning resolution put forth by the Department of City Planning (DCP). DCP Chair Marisa Lago has publicly stated a package of solutions will be proposed by Summer 2019, despite the administration’s earlier commitment to enact a change by the end of 2018. In “The Ghostly Remnant,” published yesterday in Our Town, journalist Douglas Feiden explores the curious development history of an apartment building on East 90th Street that bears the uniquely preserved facade of the Chapel of St. Joseph’s Orphan Asylum. 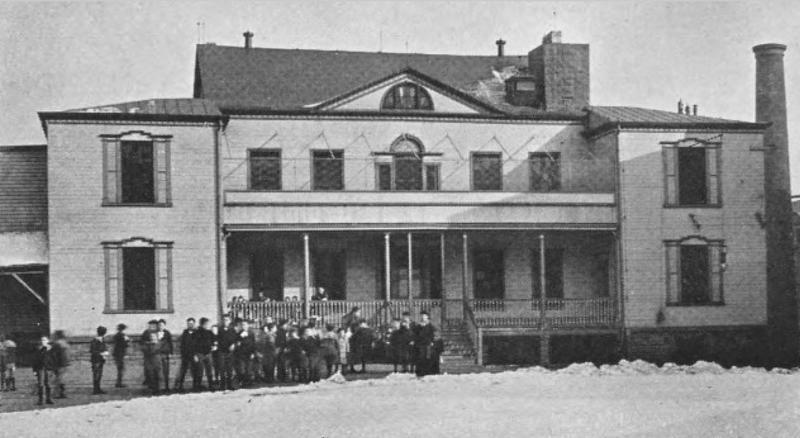 The asylum’s campus occupied the land once owned by 19th Century stock broker and banker Nathaniel Prime, whose mansion remained on the block until roughly 1918. The chapel, constructed in the early 20th century, was later repurposed as an auto garage before its conversion to an apartment in the 1980’s. This remnant is set to be covered by the construction of the Spence School’s new athletic facility, to be completed in 2020. 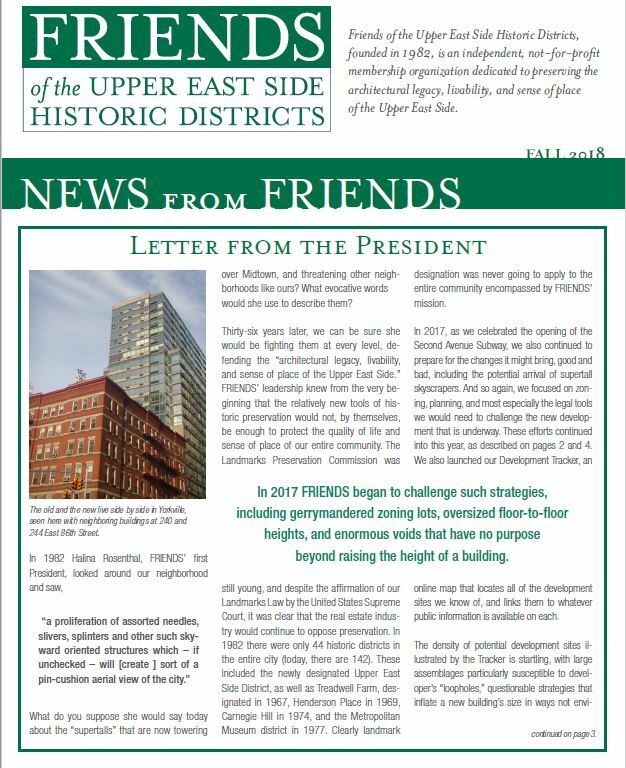 FRIENDS of the Upper East Side has been thoroughly documenting the cultural and architectural history of this block, and of this fascinating relic at 402 East 90th Street. As part of a former waterfront estate turned religious institution that served the civic, social, and religious needs of the German immigrant community, this site closely tracks the history of Yorkville that FRIENDS has long been dedicated to uncovering. This exquisite facade is one of the last surviving — and indeed the most striking — fragments of this particular strain of Yorkville’s history and it deserves to be remembered and celebrated. 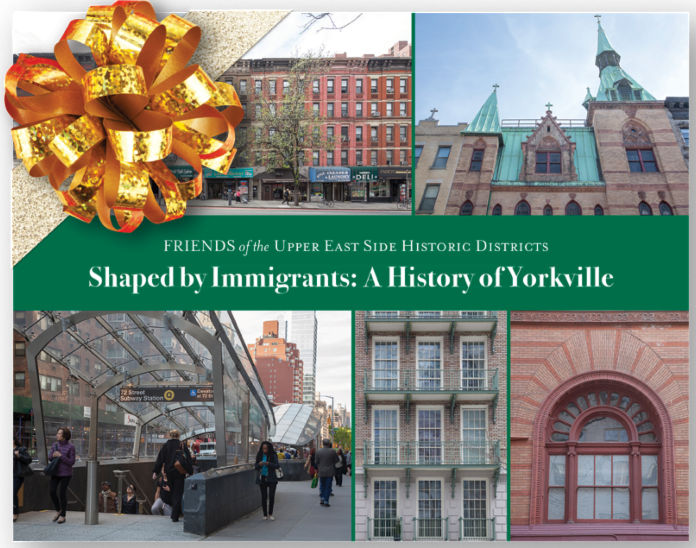 To learn more about the neighborhood, click HERE to view FRIENDS’ recent documentary or purchase our book, both called Shaped by Immigrants: A History of Yorkville. Scroll down to read the text of the article or click HERE to find the full article in Our Town. The Nathanial Prime Mansion during the Asylum years in 1907. “It’s a fascinating piece of history. It’s curious and stunning that it survived. And it should not be covered up.” Father Boniface Ramsey, pastor of St. Joseph’s Church. Photo: Sarah Greig Photography/FRIENDS of the Upper East Side. A monumental and long-forgotten Yorkville treasure has resurfaced from out of the past on a quiet crosstown block on East 90th Street – but it is quickly expected to disappear from sight. Upper East Siders wishing to glory in its grandeur and other-worldliness must not tarry: At an unspecified date, later this year or in 2020, it is set to vanish – perhaps for generations, perhaps indefinitely. The object in question is an architectural remnant, a surviving fragment from an imposing neo-Classical, brick-and-stone church. Only a single element of the original superstructure still stands – its facade. But what a facade. As a sacred site, its reign would be brief. By 1918 – with the end of World War I in sight, and UES land values soaring in anticipation of waves of returning doughboys – the orphanage began to sell off its multiple institutional buildings to developers. In Sept. 2011, Spence trustees paid $26 million to purchase the garage adjoining the church from Hertz Corp., property records show. Then last year, it demolished the structure – and lo and behold, for the first time in nearly a century, the full majesty of the church came into view. Rendering of the Spence School’s new athletic facility on East 90th Street. Rendering courtesy of the Spence School. There’s Still Time to Order Your Holiday Copy!